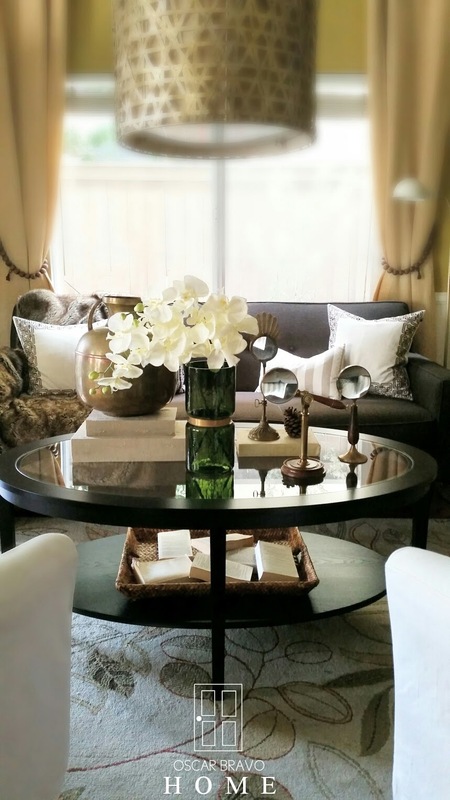 I've been wanting an oval coffee table for some time and when I came across the Malmsta table at Ikea I was super happy because I knew it was going to be affordable! I also wanted a glass top so this fit the bill. I started assembling my new coffee table as soon as I got home. It was pretty easy to assemble. I think it only took me about an hour and I did it by myself even though the directions say to have a partner help you out. It's not a bad idea because it's a bit heavy. I couldn't wait to assemble the table until someone came home to help me because I have no patience and I wanted to style it right away! The diagram doesn't show the correct placement of the holes. For example, the second from the left hole where a dowel goes is actually to the LEFT of the hole where a screw goes. Don't worry, it's pretty easy to figure that out but I was just being extra careful. Building my Malmsta was super easy. The only part that I found to be a bit challenging was screwing the top frame to the legs of the table. When I say challenging, I mean somewhat annoying. It wasn't hard, it just took a bit of time to get everything lined up correctly where everything else so far was simple and quick. SO... I guess this is why the masters at IKEA "suggest" you have someone help you. After sliding the top frame onto the legs the next step was to screw them in place. The annoying part for me was to get the barrel bolts aligned with the holes that the screws go into. What I found to be helpful was to put a screwdriver into the hole to straighten out the barrel. After that it was a peace of cake! And now I have a beautiful coffee table in the exact shape that I wanted AND at a very affordable price. The IKEA Malmsta is priced at $179. It's a good size too. It's 51 1/8" long and 31 1/2" wide. I also love that the Malmsta is higher than most coffee tables at 20 1/2" high. I'm a fan of high coffee tables. To me it feels easier to pick up a cup of coffee from (or am I just getting old?) Although some parts of the table are constructed of fiberboard, this piece of furniture feels sturdy. It comes in one finish which IKEA calls "brown black". Overall, I am satisfied at the quality, price and style of the Malmsta coffee table. I recommend this coffee table if you are a budget conscience consumer but still want style. Love this table Oscar! It looks PERFECT in your home! Great find, Oscar! I love it and it fits perfectly into your look and style for the room! !